WE MAY never know exactly why young men like Tamerlan and Dzhokhar Tsarnaev might decide to plant two bombs at the Boston Marathon finish line. But we should be able to find out exactly what law enforcement authorities did well before and after the attack — and what they could have done better. That’s what Representative William R. Keating has been trying to find out. A recent Globe investigation painted a picture of the two bombing suspects as the product of a dysfunctional immigrant family. But Keating cares less about the dysfunctional Tsarnaev family and more about the possibility of a dysfunctional system of government information sharing. Government dysfunction, he still fears, might have allowed the brothers to slip through the cracks and execute a deadly plan. And it might allow another tragedy to occur if it is not properly addressed. Keating, a former prosecutor who sits on the Homeland Security Committee, has been asking such questions since the bombs went off. Last July 31, he sent a letter to newly appointed FBI director James Comey, seeking specific information about what the agency knew about the alleged bombers before the attack and what was shared with local police. In no apparent rush to respond, the FBI got back to the Democratic Bay State congressman on Nov. 22. The FBI’s letter basically reiterated the agency’s past contention — that local police had access to everything they needed to know through a computer system called “Guardian.” The letter also mentioned the need to protect “civil liberties and privacy” while investigating crime, terrorism, and threats to national security — a curious consideration, given recent headlines about the extensive government-sanctioned data collection program that routinely violates the civil liberties and privacy of millions of American citizens who have no connection to crime, terrorism, or threats to national security. It helps to understand any breakdown in law enforcement’s ability to identify threats. It’s not about blame; it’s about prevention. The FBI’s response left Keating still questioning the quality of information-sharing between law enforcement authorities. Searching the Guardian database, he said, is like looking for “a needle in a haystack.” He predicts the Homeland Security Committee’s upcoming report on the Marathon bombings — expected in early 2014 — will address those concerns and recommend procedural changes. Keating is also looking forward to an upcoming report from a Florida prosecutor about the FBI’s shooting of Ibragim Todashev, who was being questioned about a triple slaying in Waltham, which might be somehow tied to Tamerlan Tsarnaev. The circumstances of Todashev’s death are mysterious and raise questions about the actions of the FBI, as well as about Massachusetts state troopers who participated in the Todashev investigation. It helps to understand the “why” behind the actions the Tsarnaev brothers are believed to have taken. It’s not about sympathizing with killers; it’s about sensitizing us to people who are so desperate and unhappy they turn to violence. What we learn about the Tsarnaev brothers could help us see danger signs in others and stop them before they act. But it helps even more to understand any breakdowns in law enforcement’s ability to identify threats and act on them. It’s not about blame; it’s about prevention. Keating finds the bureaucratic obstacles frustrating, and they should be to the rest of us, too. There has already been a lot of turnover at agencies involved in the Marathon investigation. Robert S. Mueller departed as FBI director in June. So did Richard DesLauriers, the head of the Boston FBI office. Janet Napolitano, the Homeland Security secretary, resigned in July. In September, Edward Davis announced his resignation as Boston police commissioner. In his testimony before Congress, Davis said the FBI should share more information about potential terror threats with local police. Those concerns shouldn’t disappear with the leaders who left their posts. Accountability should be more than one city’s concern, but Boston has a special interest in learning the whole story. If “Boston strong” means resilience, “Boston smart” should mean asking tough questions and demanding complete answers — no ducking allowed. We owe that much to the victims. Crime and the number of shootings have both decreased 31% since Mr. Bloomberg took office and appointed Raymond Kelly to head the New York Police Department. The reduction came about even as the NYPD lost thousands officers over Mr. Bloomberg's years in office and as the department confronted the heightened threat of terror. 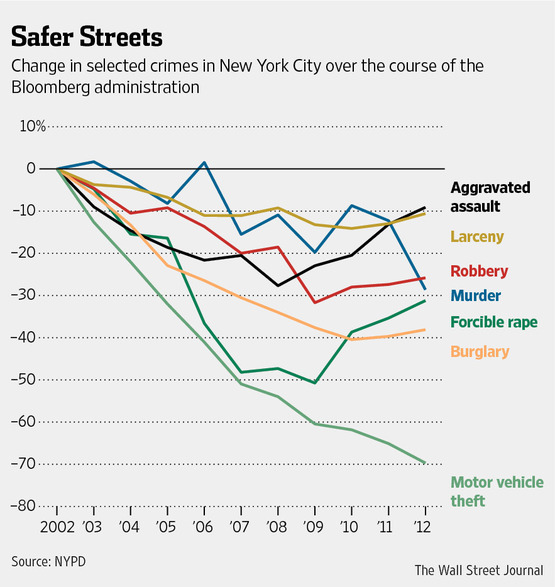 As befits a mayor captivated by measurable data, statistics—some widely lauded and others the subject of fierce debate—define the Bloomberg era when it comes to fighting crime. With homicides this year standing at 329 through Monday, the city is on a pace to record the fewest killings since the 1950s. Crime and the number of shootings have both decreased 31% since Mr. Bloomberg took office and appointed Raymond Kelly to head the New York Police Department. The reduction came about even as the NYPD lost thousands officers over Mr. Bloomberg's years in office and as the department confronted the heightened threat of terror. "It's a remarkably strong legacy," said Richard Aborn, president of the Citizens Crime Commission of New York City. "They have driven crime to rates no one thought was possible. Every time it went lower people said it can't go down any further but it has, particularly murders." But other numbers also will shape Mr. Bloomberg's legacy: the more than 5 million stop-and-frisk reports filled out by police, more than 80% of them involving black and Hispanic men, of whom about 90% weren't charged. Critics see it as a black mark on the Bloomberg years. "One of the areas in which the administration crashed and burned particularly in the last half of his third term is on the issue of stop and frisk," said Vince Warren, executive director for the Center for Constitutional Rights. "What will be remembered about his administration is that it fought tooth and nail to continue a failed police policy with respect to crime reduction that hurt far more New Yorkers than it helped." In August, a federal judge ruled the policy, as carried out by the NYPD, was racially biased and unconstitutional. The judge also ordered an outside monitor to be installed at the NYPD. The city is appealing, but Mayor-elect Bill de Blasio has vowed to drop the appeal once in office. Under Mr. Bloomberg, the city has also made a record number of misdemeanor arrests—an annual average of 220,000 between 2002 and 2012—including for possession of small amounts of marijuana. Critics, such as John Jay College of Criminal Justice sociology professor Andrew Karmen, say these relatively minor charges, many of which were the result of stop and frisk, can have lifelong effects on education and job opportunities for the primarily black and Hispanic men arrested. 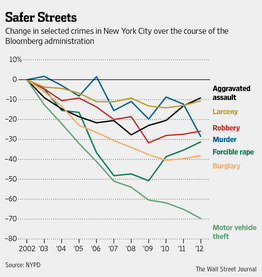 Nonetheless, Mr. Aborn said, he suspected that "in the long view of history the reduction of crime will be dominate." The threat of terrorist attacks on United States soil continues to grow, top officials from the House and Senate intelligence committees found. Most worrisome is the shifting trend from large-scale attacks to smaller, harder-to-detect events such as the Boston Marathon bombing. When asked whether America is generally safer than it was two years ago on CNN’s “State of the Union,” Democratic Senator Dianne Feinstein stated that “terror is up worldwide.” She mentioned the advancing technology of terrorism, such as explosive devices that can evade detection from magnetometers, which are used to detect metal objects or magnetic fields, is making it increasingly difficult to keep bombs out of the U.S. In 2012, the number of terrorist incidents and deaths worldwide reached a record high of more than 8,500 attacks with almost 15,500 people killed—a 69-percent and 89-percent jump, respectively, over 2011, according to report by the National Consortium for the Study of Terrorism and Responses to Terrorism (CNN). U.S. officials worry that terrorism’s increase worldwide will translate to higher risks at home.